Weathermob approached us seeking help when usage was declining on their app. After a complete re-design, the app was featured in the weather section of the app store. Driven by increased user growth and engagement, Weathermob was able to secure a new round of venture funding, before being acquired by WeatherNews. We embraced the opportunity to train WeatherNews’ developers on the Weathermob system. Through crowdsourcing Weathermob is poised to become the most accurate and predictive modeling tool the world of weather has ever seen, and we’re thrilled to collaborate with them. Overcome declining app usage by redesigning the entire front-end and revamping the entire back-end of the Weathermob application, thereby empowering anyone and everyone to report the weather. Create a new version of the Weathermob app with a streamlined user experience and back-end infrastructure, giving weather reporting ability to the user in a rewarding and fun social experience. The new version of the app received such traction that Weathermob was able to secure a new round of venture funding, and was subsequently acquired by WeatherNews. Soon thereafter, we trained WeatherNews’ developers on the Weathermob system. We were immediately drawn to Weathermob's bold and clear mission: empower anyone and everyone to report the weather. 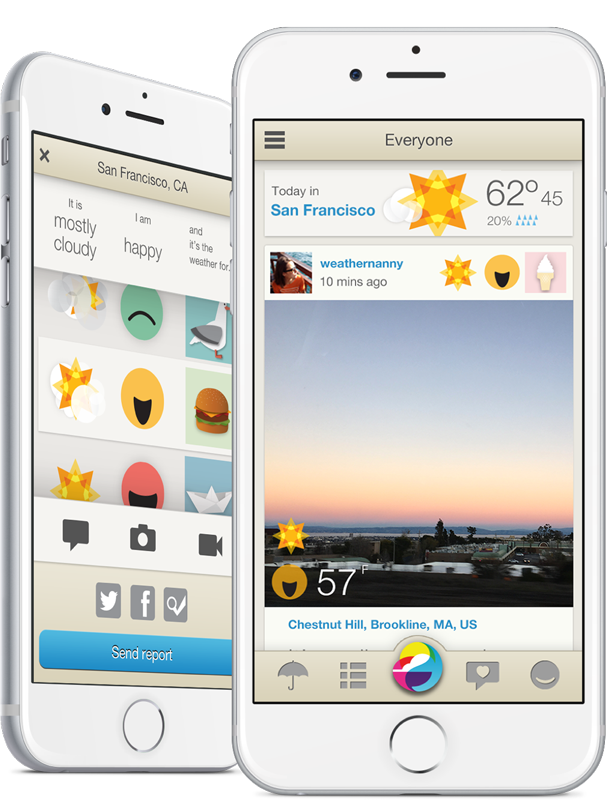 By giving weather reporting ability to the user Weathermob makes reporting a rewarding and fun social experience. With more and more people reporting from all over the world Weathermob can create a more complete picture of what the weather is actually doing. Through crowdsourcing Weathermob is poised to become the most accurate and predictive modeling tool the world of weather has ever seen. The foremost goal of this project was to solve the scalability issues of the first version of Weathermob. We had to create a system that was able to grow reliably along side its community. While upgrading and improving the existing system, it was important that Weathermob maintained its current user base. Through the delicate process of data migration Yeti was able to move all user data over to the new system with little to no issue and without losing any data. Version 2 also included a number of new design considerations. Most notably was the ability to create weather channels for locations or tags that a user wanted to follow. All of this culminated in the rapid deployment of a stable and solid Weathermob that was more enjoyable and easier than ever to use. Since the launch of Version 2, Weathermob has been able to hang several major accomplishments to their walls. They have been featured in the Apple App Store, enjoyed a number 17 ranking in the Apple App Store in Japan, and raised an additional $650,000 to continue growing and expanding the Weathermob community.